Another day, another show based in a magical academy. Thankfully though this school is geared towards straight-up brawling which makes it a little different and far less nebulous than others have been in recent seasons. Needless to say though, it’s still going to be hard to stand out from the crowd. 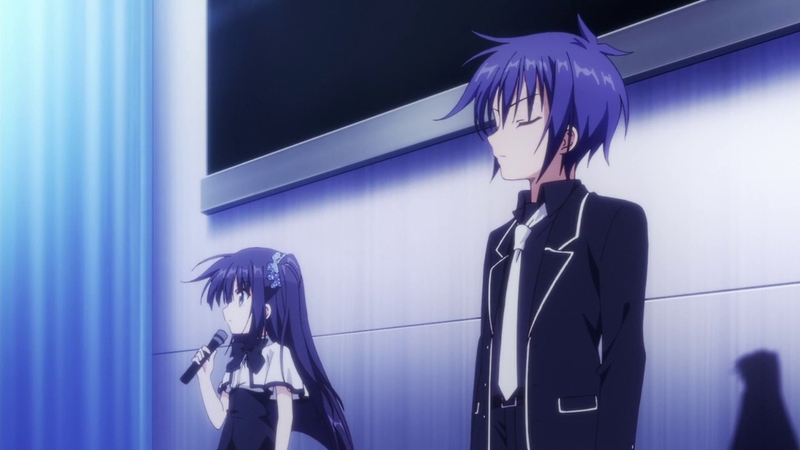 Can Absolute Duo break through convention and be an absolute success? Enter Toru, a brand new student at Kouryou Academy, a place of learning which seems to borrow its architecture from all corners of the world. That’s not the only thing that this show borrows from other sources; most of the plot is from something that most audience members will have seen before. Toru’s quirk is that he is considered an “Irregular” because his soul-based weapon or Blade is a shield whereas the typical Blade is an offensive weapon which varies depending on the user’s soul. This doesn’t mean he is a weakling, he can channel his spirit energy into a powerful not-Falcon Punch. This anomaly attracts the attention to the standard child prodigy from another land with silver hair and innocent outlook on life, Julie Sigtuna. 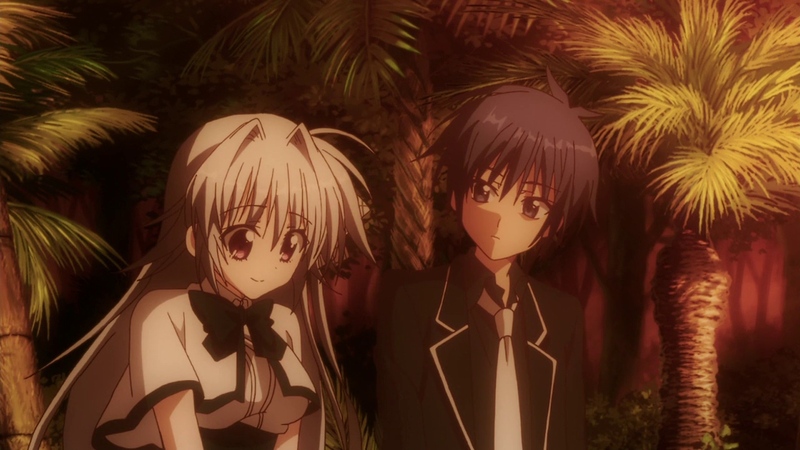 In typical harem anime fashion, these two are placed together as partners at the academy, called Duos. Each Duo fights together against the rest of their class in battles which are scattered throughout the campus. As we go forward into the story though, it’s clear that the origins of the Blades aren’t as clean-cut as they seem. What seem like spiritual weapons are actually psychosomatic tools, meaning if you want to cause actual harm, you channel that thought into your tool and it is imbued with it; not that that the students are told that at first. Shame that this nugget of intrigue is almost lost within the sea of mediocrity. Absolute Duo to me seems like a show run by committee who have watched tons of harem anime and know what will sell discs and books. This anime was based on a light novel written by Takumi Hiiragiboshi and the results add to my notion that most light novels these days tend to get shoddy or sub-par adaptations. Hiiragoboshi and the FIVE producers of this adaptation shoehorned as many cliches as physically possible into a twenty minute magical academy formula. 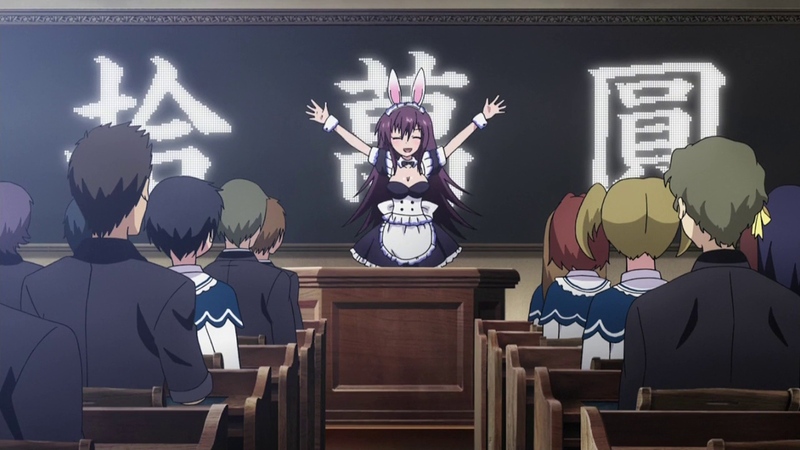 You have the stoic leading lady with the supreme skills [Julie], the unusual main character with a tragic past [Toru], the serious one [Tachibana], the one who’s well-endowed and self-deprecating [Hotaka] and the overly peppy teacher [Tsukimi] who wears rabbit ears and has a really forced cutesy voice and patronising demeanour clearly instilled to titillate but thankfully is rebuffed by the rest of her class as weird. That being said, just because this is generic doesn’t mean it’s bad; it just means it fails to inspire. What it does do is produce a show which is of decent quality. The cliches at play are done with a modicum of flair and style. The animation is alright and harks back to Infinite Stratos in look and feel [which makes sense as both shows are animated by the same studio, 8-bit]. All this predictability is solidified with a short flashforward [like in World Break this season] of Toru and Julie fighting each other, which implies that the intrigue that Julie had for Tory turns from mild curiosity into a desire to destroy or so it seems. I tend to find flashforwards to be major spoilers of shows; sure it leaves you intrigued to find out what happens but if you’re watching this as it airs, then you have to wait for weeks and wade through a sea of average teenage angst and magical drama. That being said, none of the characters are terrible or unlikeable, they’re all good people with a desire to embrace their skills or sheer luck [Only one in a thousand people are compatible with this world’s wonder drug, Luciful, which empowers the host.]. What I don’t like is that the students are being made into soldiers pure and simple, it all seems rather morbid in a way. Not to mention that each student gets one hundred thousand yen a month [roughly eight hundred and fifty dollars] to play with with their ID/credit card because reasons. It all seems rather convenient and forced. It’s hard to say where this will go in the end, but based on first impressions and the show’s first arc, it’s going to be less than great. 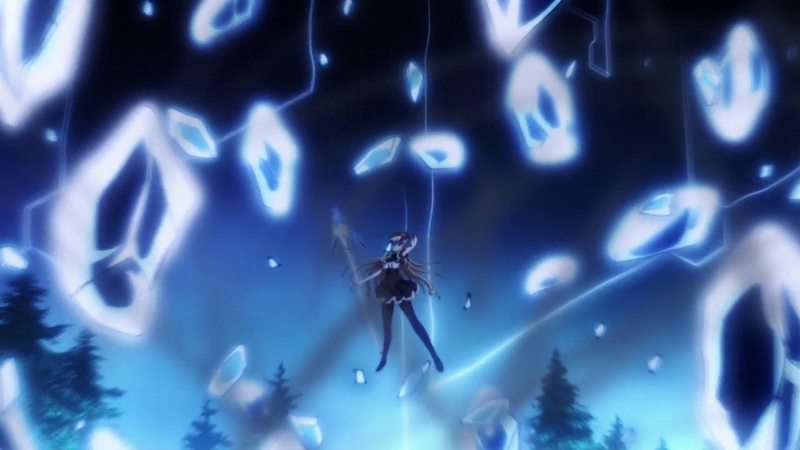 Absolute Duo is a decent show which does enough to pass through most filters as a nonoffensive product. It ticks the boxes in what makes a regular magical harem production without pushing any boundaries but not aggravating the audience with anything glaringly poor or rage-inducing. It’s alright, middle-of-the-road, meh. Whatever you want to label it, it’s not bad. I don’t recommend it because there are better shows out there. If you do choose to watch it though, you’re not going to regret your choice but neither will you remember it after you finish it. 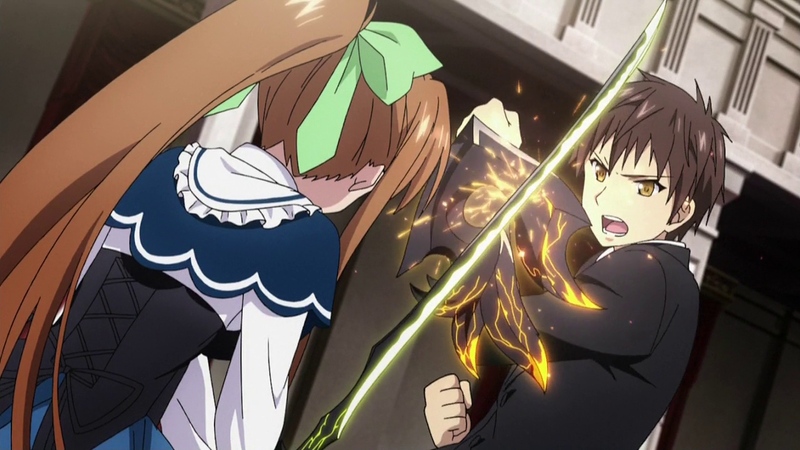 Absolute Duo is available to stream on Funimation. If you like what you’ve read, then please check out our Patreon for special Anifile bonuses. I am not going to lie, I feel sort of dumb that I didn’t think of this before. 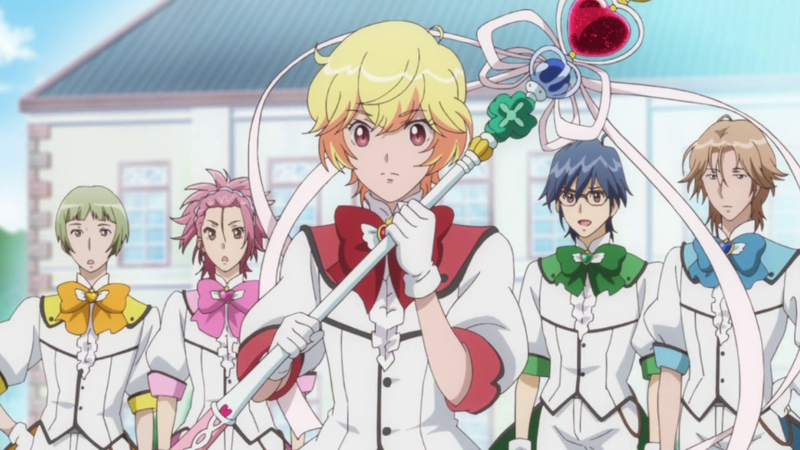 Why not take the magical girl formula which has been around since the eighties and flip the gender convention on its head and put pretty guys inside the costumes and see what happens? 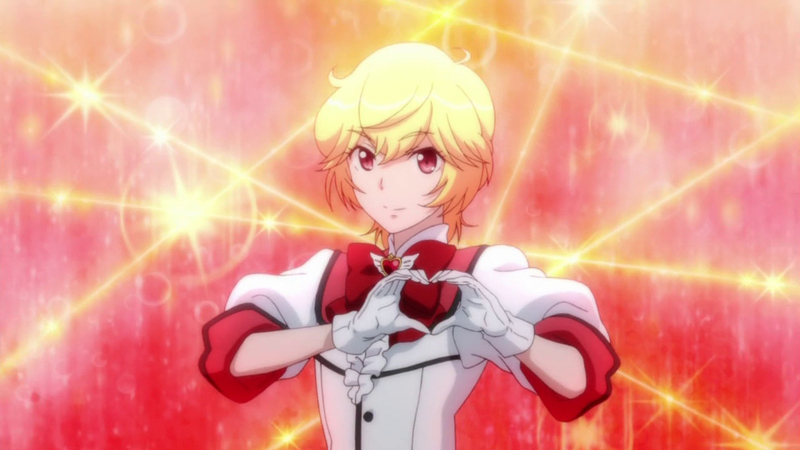 Well folks, the time has come for us to realise this neglected notion and celebrate Cute High Earth Defense Club Love! for its refreshing and lampooning of a genre which has seen too many stale copies in recent years. Binan High School is a very prestigious school full of talented individuals from all walks of life. It’s only natural that you’re going to get perfect candidates for a team of powered pretty boys. However, when we first meet some of our heroes [En and Atsushi], it’s in a public bath where the debate is about chikuwabu, the Japanese wheat-based addition to most curries and udon dishes. Suddenly, a space wombat with pink fur makes a literal splash. When the bath’s attendant Yumoto [our leader] finds the Wombat he immediately falls in love with it; love being the operative word for this series. When the three get to school and their after-school club [The Earth Defense Club [lol]] and meet up with the other members, Io and Ryuu, they are in for a surprise as they have been picked to become magical guys with powers, staffs and dresses/uniforms. It’s all a shock to most of them but they’re thrust into the limelight. Using the power of love in a suitable hammy fashion, they protect Binan High School from the forces of darkness and negativity which is being militarised by the Conquest Club and the evil Thunder…a tiny green hedgehog. Yeah. If it isn’t clear by now, then it should be pointed out that this show is not meant to be taken seriously nor is it meant to be a malicious attack on Sailor Moon, Pretty Cure or its clones. It’s simply an innocent parody using boys instead of girls. Nothing insinuated, nothing profound or analytic; just a laugh. A very well put together laugh mind. There’s an ongoing commentary about the impracticalities of being a magical person; the odd costumes, the overly elaborate dialogue and poses and of course the infamous transformation sequences. Yumoto and the crew are the vehicles for the crew at Diomedea and the show’s director Kurari Umatani to spark some originality into the bloated magical girl genre which is a tired formula by now with only the odd injection of flair every few years, Madoka Magica anybody? Unlike the aforementioned anime, Cute High Earth Defense Club Love! is a comedy pure and simple. It’s also a legitimate magical show with villains, powers, mascots and drama; it deserves to be considered in its own right because of its humour and creative nuances. 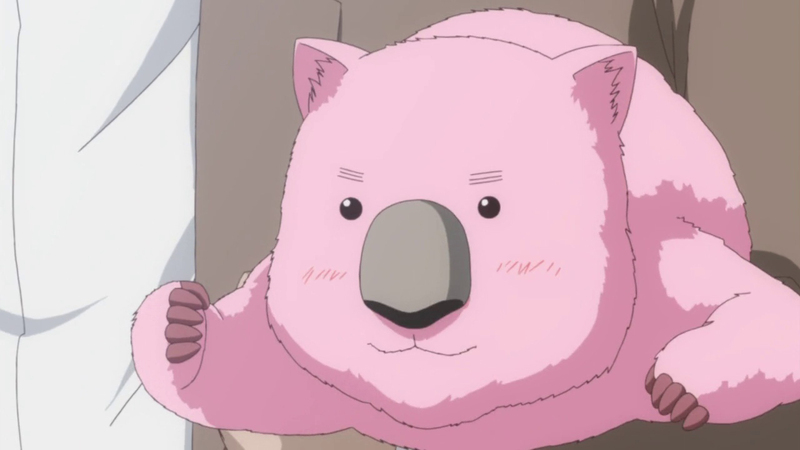 One thing worth noting is Wombat; the cute interdimensional marsupial. He has the power to bestow these skills on these boys plus possess people in order to blend in…unlike other mascots, this isn’t a clean cut or sugar coated talent. In his fear-induced panic when he first got here, he ended up killing an old man who conveniently is a teacher at the high school; sure it was an accident but there’s no escaping seeing the blood of a mangled corpse on the floor! These little jibes at mascots made me double take something fierce which is what I want in a show; something to keep me engaged and change the formula every once in a while. The show is helped with a strong animation team from the looks of things. Everything looks good on the surface and the details are present and correct. They have to be for this kind of show. It may not be a super detailed universe but these characters are meant to be pretty and sculpted; if they’re off by even a fraction then it will ruin the illusion for everybody. This being a magical person series, recycled sequences are a given so it does save time and resources just reusing a scene or two or seven in each episode which can then be put to good else everywhere else. I just wish it could’ve been used to develop the characters a little more. We get a good idea of Yumoto’s persona, innocent and care-free with a strong work ethic but with the others there’s not much going for them. Ryuu is obsessed with girls, Io loves money, En is a lazy sod and Atsushi is the serious one. I’m sure more development will come in later episodes, but it would’ve been nice to dedicate some more time towards their backgrounds. The villains on the other hand seem to act like a hive mind with Kinshiro, the lead boy, having a childhood bond with Atsushi and thus fuelling potential drama later on which will undoubtedly be hammed up to the extreme in an adept manner; I trust this show to do it superbly. Cute High Earth Defense Club Love! is the perfect parody for an anime format which has so many flaws and inconsistencies in its DNA. It doesn’t attack it though, the producers know that people are fans of the genre; so instead they act like mutual fans of the genre and saying figuratively “What’s up with that or what’s up with this? Ain’t that odd?”. Commentary instead of criticism is the situation here and it works wonderfully. As a standalone show, it’s still very good! Refreshing and vibrant; this is certainly a show to look forward to when it gets an English cast. If you enjoy Free! or Shounen Hollywood then you will love this. Cute High Earth Defense Club Love! is available to stream on Crunchyroll or Funimation. If you like what you’ve read, please check out our Patreon for special Anifile bonuses. The magical sci-fi genre has really seen an increase in production in recent years. Infinite Stratos started this back in 2011 and now, four years later, we are seeing its closest clone yet in the form of Unlimited Fafnir. Seriously the similarities are way too obvious to ignore! Things begin with Yuu Mononobe when he finds himself on Midgard, an island stronghold where powerful warriors known as Ds fight using dark matter. Yeah. The stuff that makes up ninety-nine percent of the universe that we have NO CLUE what it is; apparently it’s magic! Its discovery as an enabler for wannabe magical girls everywhere was when the imaginatively named Dragons attacked the Earth twenty five years before present day. Yuu and his sister Mitsuki witnessed these monsters up close and like thousands of girls [cos apparently its influence works ONLY on girls…well before Yuu came along that is] and obtained these magical powers becoming the Ds! Yuu’s first encounter with a D is in the form of Iris who is your typical clumsy main character with the too-cute-face. She’s so prone to pratfalls and promiscuousness that it’s not even funny. 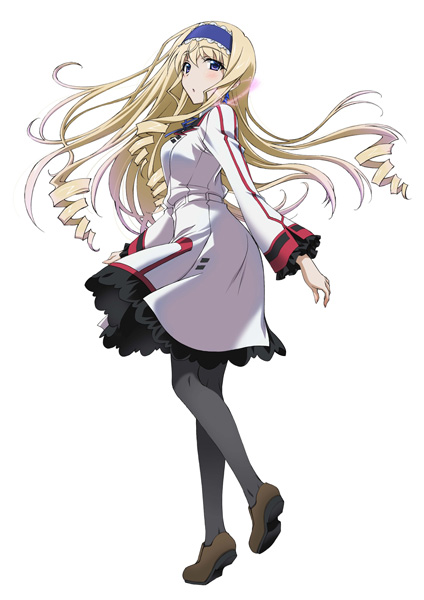 Yuu is also the first male student of Midgar’s academy and he is naturally met with curiosity and the traditional hatred [Enter the token hauty British girl who is SO NOT RIPPING OFF CECILIA ALCOTT from Infinite Stratos]. It’s so far so stock; I could easily forget about this show but I can’t because it manages to foul up key stuff. The biggest problem is that the artwork is really inconsistent and cheap. Characters’ eyes change shape, size and even angle throughout the show and heaven forbid if you draw people from a distance – it’s either have them right in your face and they’re drawn well or far away and not good. Then we get to the Dragons themselves; the idea behind them but their designs are ABYSMAL! This is 2015 and we’re getting CGI like that in a broadcast-ready show? WOW. It would like more at home in a mid nineties video game. 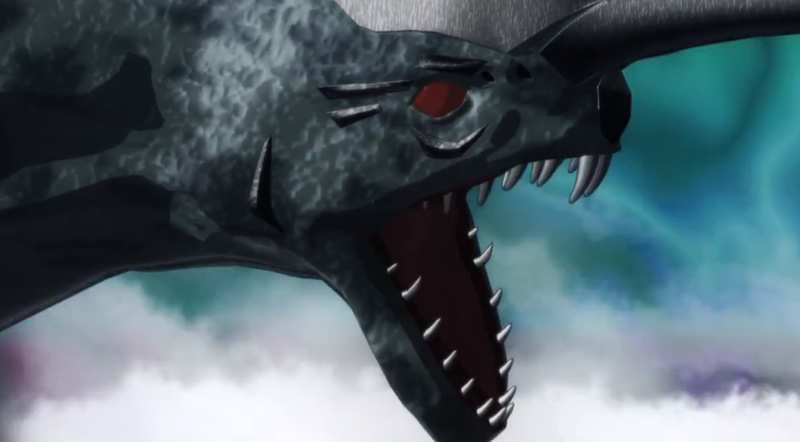 This was probably the worst computer imagery I’ve seen in an anime and it ruined the illusion of these Dragons being scary. Also, do you guys get a hint of Pacific Rim kaiju from the designs? Yeah, this show is filled with references to other shows that it may as well as be pure meta. Except one thing. These not-kaiju are roaming the Earth in search for a mate; their mates being Ds. Yes. These horny beasts are looking for some action from these girls who become Dragons when touched or get near another Dragon. At least it’s not as nasty as I first thought but still, that’s weird. Really weird. So the artwork may be sub-par, the story a carbon copy of other series and the monsters poorly executed but at least I like the two main characters – Yuu and Iris. Yuu is a double agent working for NIFL, the official agency tackling the Dragons outside the Midgar watch and he is infiltrating the school to kill vulnerable Ds who are in danger of going astray which in the early episodes involves Iris. Yuu has a strong moral compass and knows what’s right and what’s wrong; he also doesn’t take advantage of Iris’s fondness and she shows a lot of it with a fair bit of awkward yet not teribbly forced fanservice. Iris is cute but clumsy, a stock character but she does show skill when pushed hinting at strong development for her in the long run which is great. She is also really nice to Yuu despite his initial fumbling; she has been so lonely up to now and she finally has a real friend; sure it may be corny as hell but I dig it. Other than that, there are no other memorable characters except for Yuu’s sister Mitsuki who is the student council president and in charge of Yuu whilst he’s at the academy. Oh and she’s very bossy. That’s all I get from her in the present day. The rest of the show is just too generic to stand out unfortunately. I won’t call Unlimited Fafnir awful because to be truly awful, you need to REALLY do things badly; things which are easy to implement but still manage to be nigh on impossible. This show ticks the boxes in a manner which is sufficient to pass through the filters and come out the other end as yet another generic sci-fi magic show. It’s a cash-in for those who liked Infinite Stratos or Horizon in The Middle of Nowhere. Also I forgive it a little as it’s clear that Diomedea, the animation studio, did this show on a far lower budget than its other shows this season and possibly with a less experienced staff. In the grand of scheme of things, there are better anime out there to enjoy. Although I will give a thumbs up for Iris though; she’s cool and I want her to do well but I won’t stick around just for her. Unlimited Fafnir is available to stream on Crunchyroll. If you like what you read, please check out our Patreon for special Anifile bonuses. 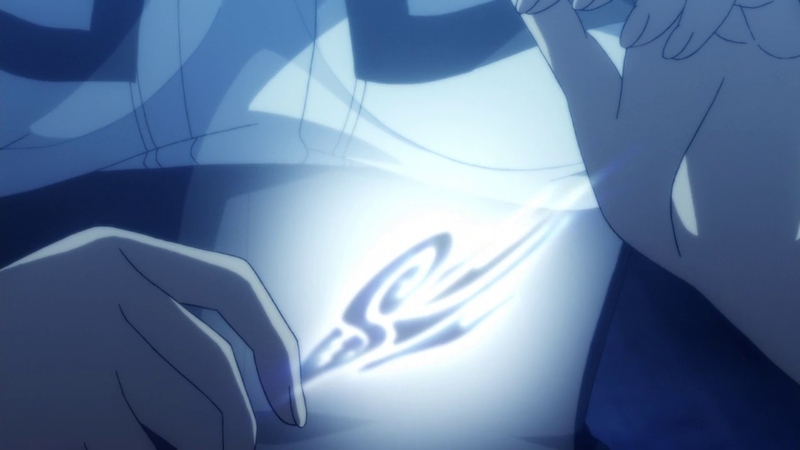 Anime about magic academies have not worked as of late with the exception of shows like Witch Craft Works. Last year’s Magical Warfare or Dragonar Academy screamed ‘poorly constructed and generic magic Harry Potter clone thingy’. It’s safe to say that this type of story is very prone to poor writing and being shovelled full of fanservice. 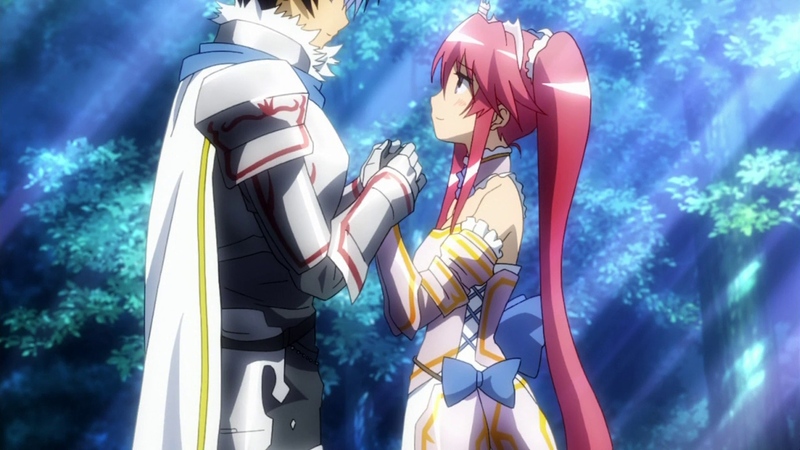 Does World Break: Aria of Curse For A Holy Swordsman break this mould? Well…not quite. The story takes place in a world where magical demons terrorise shopping malls near conveniently placed lakes and magical academies exist all over the world to harness the power of the Light and suppress the Dark Arts [check]. Our main character, Moroha, is an average student with a tendency to be way too relaxed about stuff but somehow possesses a hidden power inside his soul [check]. We have a flash forward to denote that character progression DOES happen but we have to sit through three months of angst to get to that point again [check]. Oh, we have girls vying for his affection and pants [CHECK]. Suffice to say, World Break ticks all the boxes of a harem anime with nuanced magical traits [well I say nuanced, more like BLATANT]. Moroha and his friends Satsuki and Shizuno are remnants of his past lives who found themselves reunited. 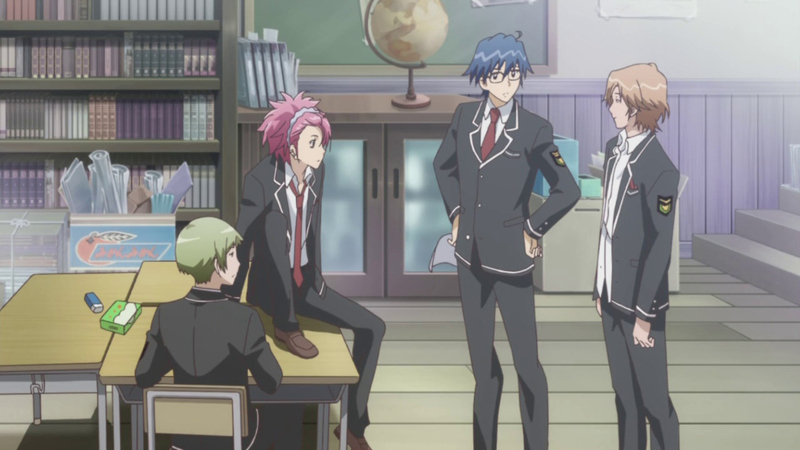 All the students at this academy [#4930] are here because they have memories of their past lives where they had powerful abilities and it’s the school’s job to tap these resources. Naturally Moroha and pals have above average skill [in fact Satsuki and Moroha were once siblings and have a strong affinity which boosts each others’ powers] and so initiates them into the school’s Strikers brigade. It’s all rather convenient but are you REALLY surprised? REALLY? 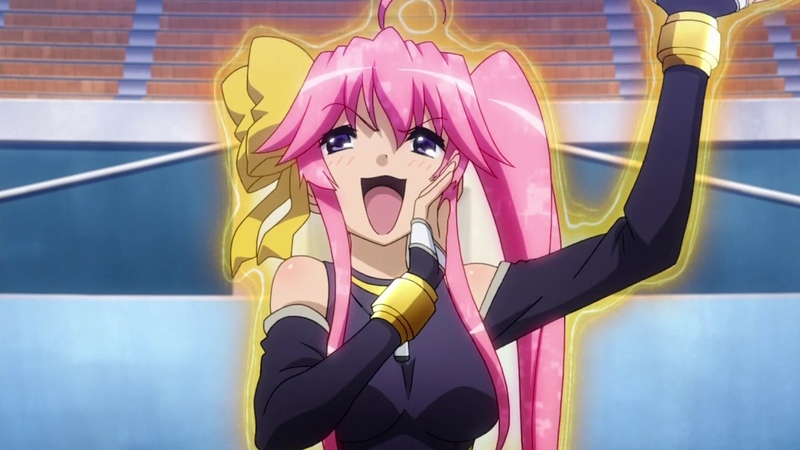 World Break ISN’T TERRIBLE. However, it’s furiously generic with tons of things we’ve seen from different magically orientated series which are sadly done better. The fanservice is LITERALLY shoved in our faces a couple of times in the first episode alone when Satsuki and Shizuno spat about their busts and Moroha then throwing out the ‘tactful’ comment that Satsuki is too bony. Nice. It fortunately doesn’t go further than that, the number of awkward falls and gropes are kept at a bearable amount but the vapidness of Satsuki is hard to ignore; but at least she’s good at what she does albeit being arrogant…and annoying. I think what got me more was the questionable voice acting and comedic visuals. There’s one scene where Moroha is comically shaking his head but it looks really odd and it’s accompanied with a bemusing sound byte which made me triple-take. Yeah. 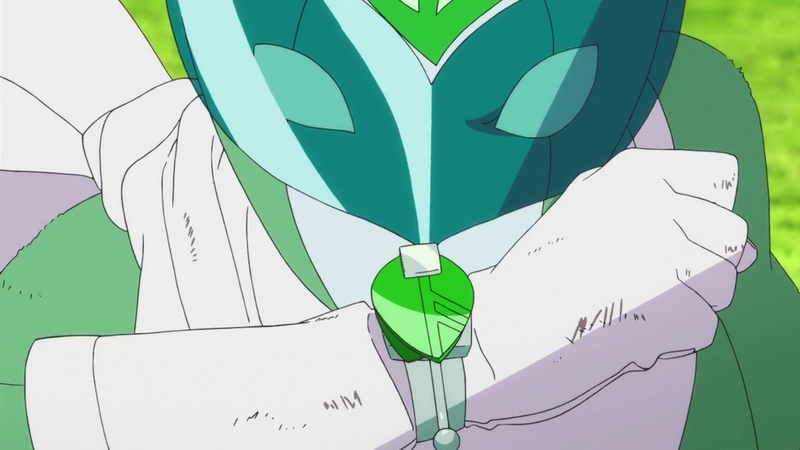 Then the Big Bad of the episode’s voice was WEIRD and it didn’t suit his body type which jarred the fight scenes. It all leads to a disappointing first episode. 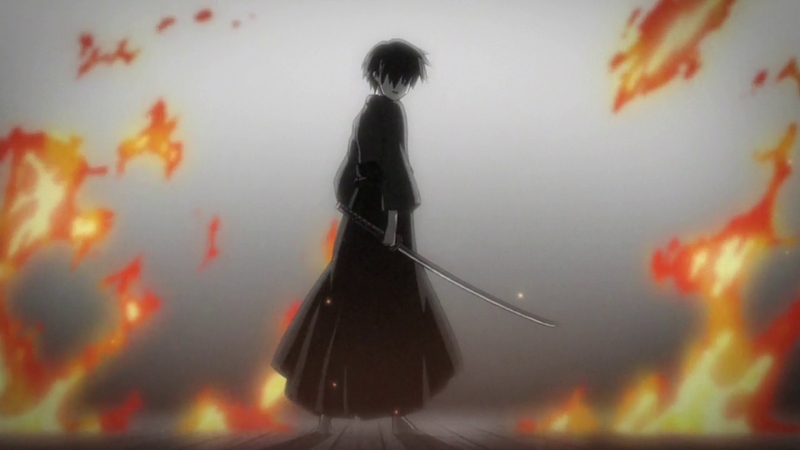 What makes Moroha different from most is that he can remember ANOTHER life; back from a different time when he and Shizuno were powerful dark magicians. This connects them as well as he and Satsuki from a future time. It’s this connection with Shizuno which keeps me watching; I like Shizuno. No it’s not because of her frontage; it’s because she’s a more complex character then she is first given credit for. Her family owns the school [her brother is the president] and she was taught dark magic from an early age [an unfair advantage] so she can be a guaranteed leader, she is merely a tool in the family’s master plan. Until Moroha came along she had no freedom or drive and found solace only in dreams; it may sound sappy to some but it moved me. I felt sorry and wanted her and Moroha to buddy up; but her brother tries to stop it by ‘bestowing’ an S rank on Moroha giving him the best pay and prestige in the land…at the cost of his freedom and rights. He would become a weapon, not a person. Yeah, it’s all well and good to be super powerful but when the government treats you like some kind of nuke instead of a human being, what good is that? It’s plot points like the two mentioned just now that gave me faith that this show has potential to be alright; it’s not going to be amazing or even very good, but it could be decent. I have hope. The magic elements of the show are pretty cool too! 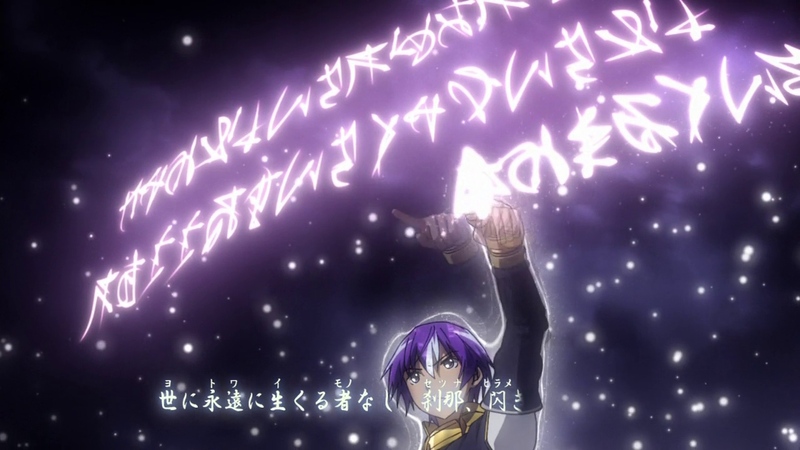 It has a cool calligraphy vibe with a ghostly incantation which evokes strength and eerieness [and for those thinking that standing still chanting whilst monsters are attacking is stupid, don’t worry, the anime has thought of that!] which is a lot more original than examples I’ve seen recently. I really dug the first four minutes of this show but because of the fanservice and harem elements it quickly began to fall down my pecking order. The animation quality is very inconsistent but mostly lands in the good bin. Diomedea did an alright job in the end but there are times where the drawings look oddly proportioned or a breast is oddly triangular [image three]. It mars the quality of the show somewhat but I’ve seen worse shows in my time so it passes sort of. 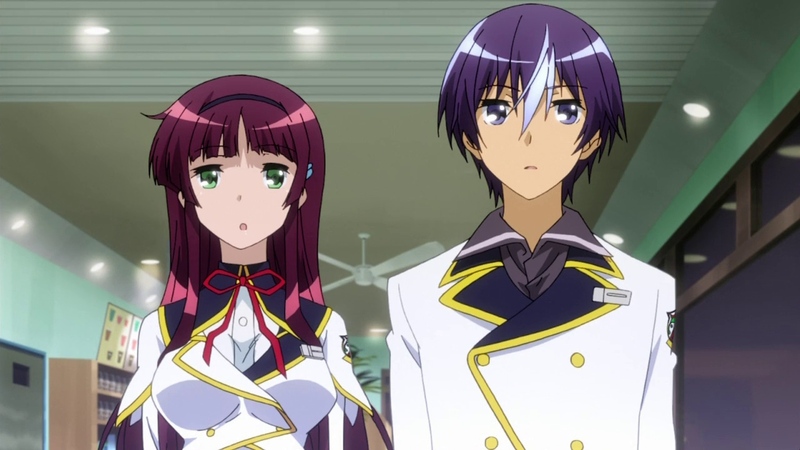 World Break is a better iteration of the magical academy harem anime. It’s not the best or even a good example but it’s passable. Despite this being the third lowest anime on my readers’ poll, I rate this higher for the fact that it tries to be clever with its characters. It’s not a powerhouse of plot but it’s something that you could possibly watch if there was nothing else on or you REALLY wanted to watch some magical harem stuff. I’ll stick with this and see if it holds up but I don’t expect greatness. 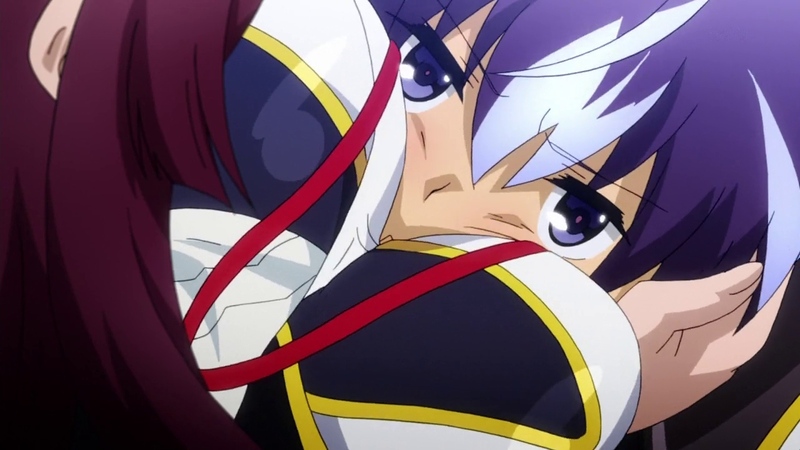 World Break: Aria of Curse for a Holy Swordsman is available to stream on Crunchyroll. If you liked what you read, please check out our Patreon for special Anifile bonuses. In the wake of Kill la Kill in 2013, anime has become a lot freer in convention and expression; studios have been inspired to let loose with their visuals and truly go nuts! Two years later, we are beginning to see the impact the Trigger produced show has had on anime. The Rolling Girls gets the ball…rolling. The Rolling Girls takes place in an alternative timeline where Japan has been split into its respective prefectures following the “Great Tokyo War”; the central government has disappeared leaving behind a divided nation free to express itself without politicians and bureaucracy. In the midst of this, each prefecture has flourished and began to develop a unique identity and feel. Ten years after this happening, Japan is a very different place; it looks like a child has gone to town with a box of crayons and paint. Wow. Wit Studio, the developers of this show, didn’t hold anything back here! However, things aren’t as rosy as they seem or look. Despite the lack of political warfare, gang mentality has sprouted up and vigilante groups constantly roam the streets where two types of citizens have emerged – The Best and the Rest. The Best fight in an explosion of colour and no blood whereas the Rest watch on and aren’t permitted to fight; merely there to support the Best. Enter Nozomi, our main character, whose best friend Masami is the masked warrior known as Maccha Green. After battling a Best-for-hire, Shigyo, both fighters are incapacitated and their special heartstones are confiscated. Whilst in the hospital, Nozomi vows to find more of these heartstones and bring stability to the region of Tokorozawa. 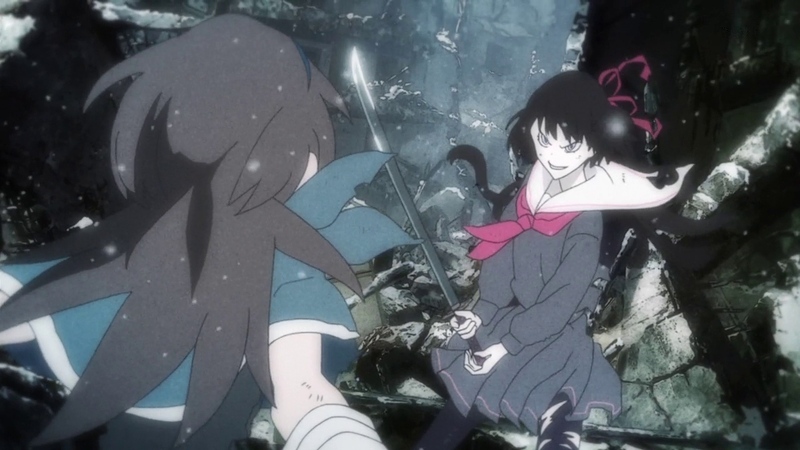 As I stated at the beginning of this review, Wit Studio has produced a show which is heavily influenced by the modern classic Kill la Kill in many ways. These range from overall flair, action, art style and characters for the most part. However, it’s not as violent nor as polished. 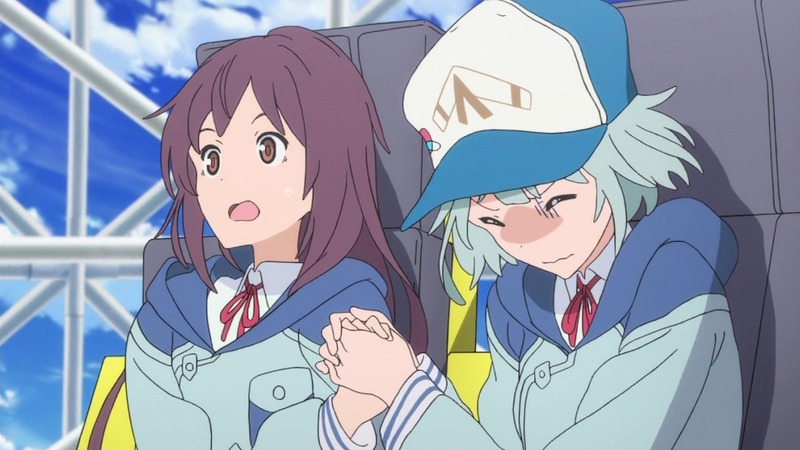 The Rolling Girls is a competent show which shows a great amount of effort and complexity in terms of on-screen content but it lacks something when it comes to the overall story. 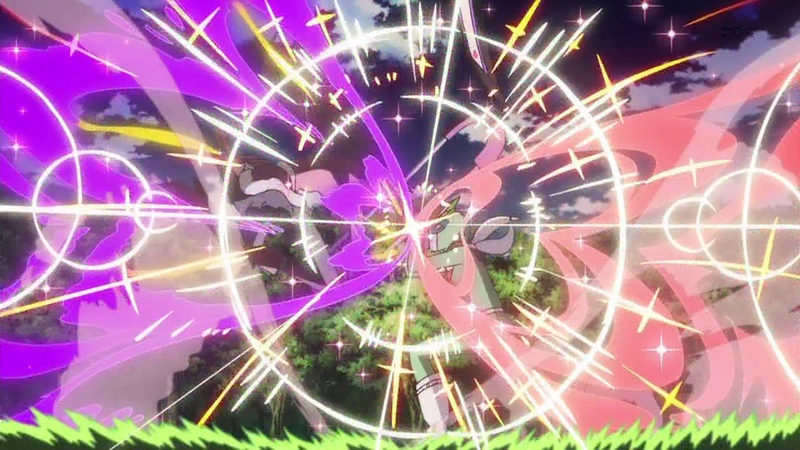 You have to pay attention in the opening half of the first episode or else you’re going to get lost and it’s easy to do so; there’s so much going on in front of you that it doesn’t take much to be disorientated and resulting in you having to pause and go back. Heavy exposition and a lot of standing around is to be expected in this show, or at least in this first arc. Things did settle down but I felt a disconnect; the vivid world I saw in the opening sequence clashed with the traditional view of Nozomi’s town in Tokorozawa. Was I in the same country? I wasn’t sure. Its locations are too jumbled up to make sense and you have to think carefully which hinders enjoyment overall. I think that The Rolling Girls needs a little more comedy in order to establish itself; its bright atmosphere lends itself to becoming a pastiche of Kill la Kill and acting as a satirical take on an already satirical show. Hmm. Double satire? I will give this show credit for being a lot more distinctive than shows I’ve seen in the past but the important thing to remember is that the main character Nozomi is the focus here, not Masami or Maccha Green. The initial battle was used to illustrate the vigilante mentality at play in this world. When Nozomi ventures forth across Japan with her band of merry gals [Chiaya, Ai and Yukina] we begin to understand that this is more of a quest-driven series AND explains the Rolling part of the show’s title; these girls are on the road and meeting different leaders of prefectures and illustrating just how Japan has been torn asunder and started anew. This is a voyage of discovery and I get that Nozomi…just not with her crew. They don’t seem particularly skilled; Chiaya is a mono-syllabic girl who happens to have a stone, Yukina is the clumsy one with a poor sense of direction and Ai punched someone and is looking for attention. Yeah, not the most compelling team but that means that there’s the opportunity for them to improve fast…or stagnate, hopefully the former. When we get to Tokyo itself, we are greeted with the visage of the Tokyo Big Sight where the Japanese Comiket convention takes place twice a year; its purpose now is the hub of the Tokyo prefecture where cosplay is the dominant trend and has carved out new Tokyo’s identity. I found this amusing and I felt that this originality should’ve been carried over into Tokorozawa but alas no. Perhaps that town’s blandness is meant to mirror Nozomi and her trip will help define herself in the world. That’s a cool idea and I hope that remains the case. It’s a curious notion. The Rolling Girls is a long-term investment. You need to wait a little bit before the pay-off arrives. You’re thrown a lot of plot in the first episode and it tends to fall back in the second and then resurge again. It’s an undulating experience but one with potential. It’s not a cash-in of Kill la Kill that’s for sure; it’s different enough to hold its own and warrant a watch but it needs to work its characters hard in order to generate a worthwhile experience. The Rolling Girls is available to stream at Funimation.